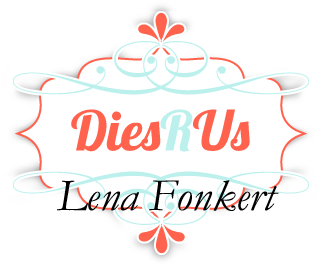 Hello Dies R Us friends. 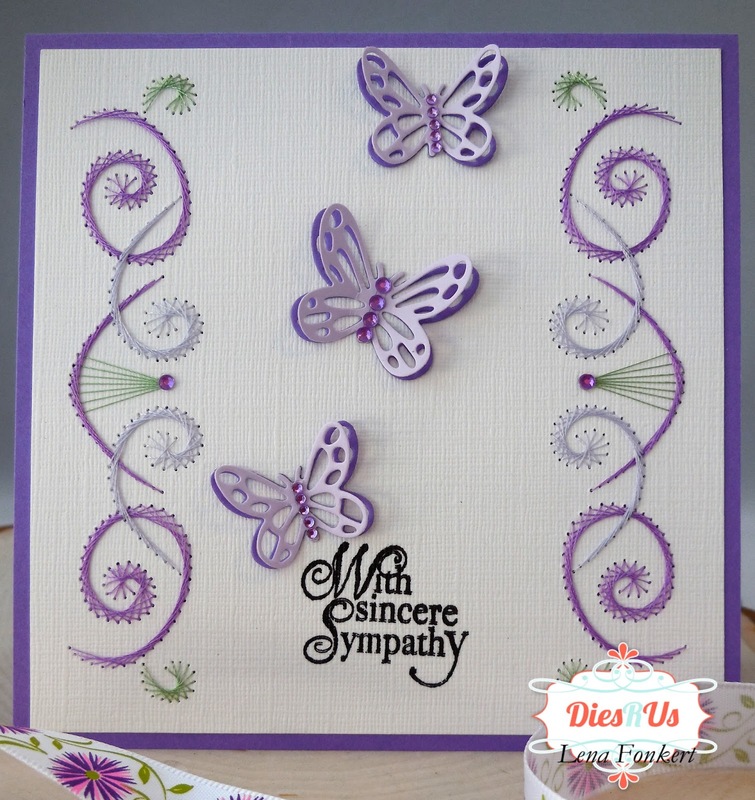 Lena here today sharing some more sympathy cards. It's a rather long post, so grab a cup o'java and enjoy. As I mentioned before, these are the hardest cards for me to make and having to make 3 as the New Year starts was definitely not easy. A sweet friend told me that she always keeps some on hand because that way, when she has to send one out, it's not so heartbreaking to make them. Well, that made a lot of sense to me so I made an extra one that I'm also going to share with you. 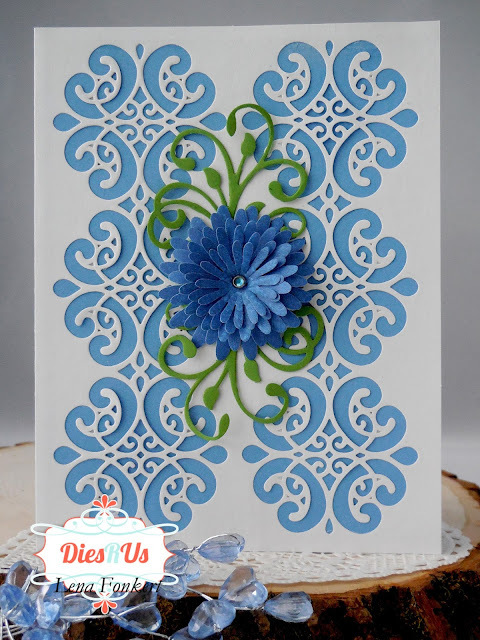 So for my first card, I used the Garden Classic Lace Frame from Jeanine's Art. 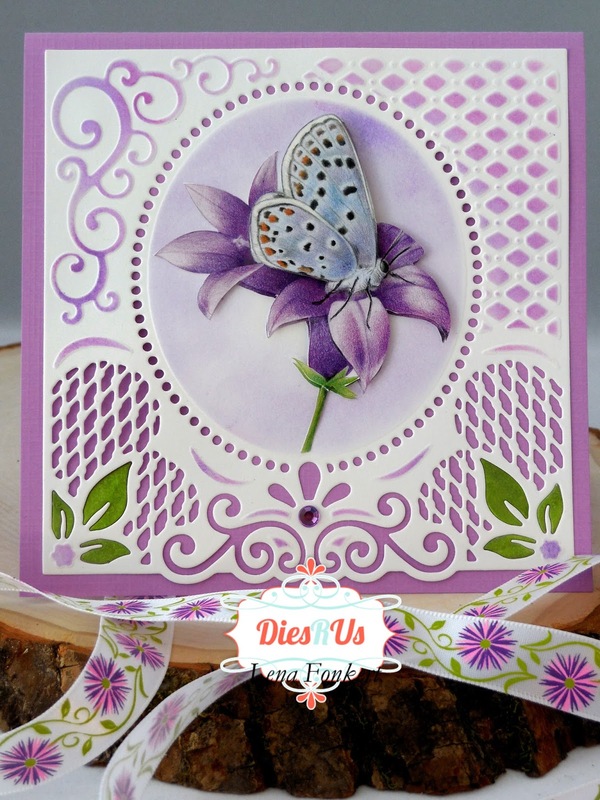 While the cardstock was still in the die, I used a dauber to sponge Memento Lilac Posies ink on all the embossed surfaces. The image was cut from a 3D decoupage sheet. In order to add a little bit of green to go with my image, I coloured the cutout leaves green and paper pieced them back into the frame. Lastly, I added a little gem as a finishing touch. This card measures 5.5" x 5.5". For the inside of my card, I printed the sentiment and added a little butterfly which was cut using a die from Marianne Designs called Butterfly Border. Remember that, every so often, Dies R Us runs a big sale on international dies. 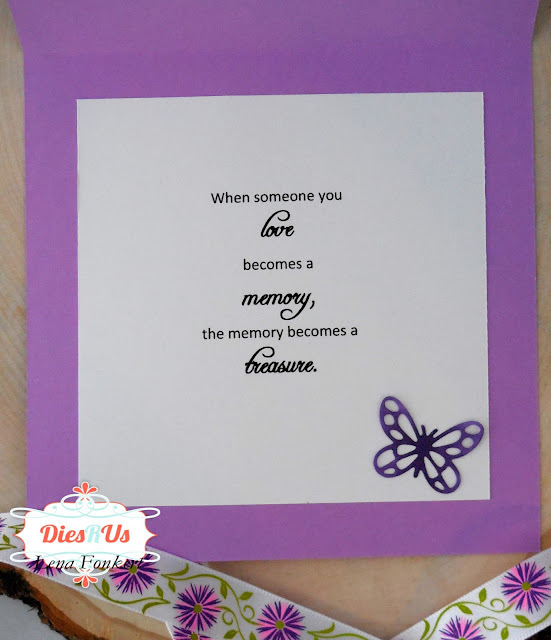 During these times, you will find dies from companies such as Marianne Designs, Lea'bilities, Joy Crafts, etc. 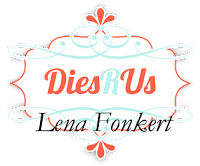 The best way to know about these fabulous sales is to subscribe to the Dies R Us Newsletter. If you scroll down to the bottom of the page, you will be able to enter your email address and be put on their mailing list. For my second card, I used the Striplet - Rococo Die from Sue Wilson and cut it out twice on the front of the card. I used a piece of powder blue cardstock for my backing.. Next I added two Sprigs from Spellbinders and placed them facing away from each other. Using a Zig two-way glue pen, I adhered them to the card, leaving the end leaves loose to add movement to the sprigs. 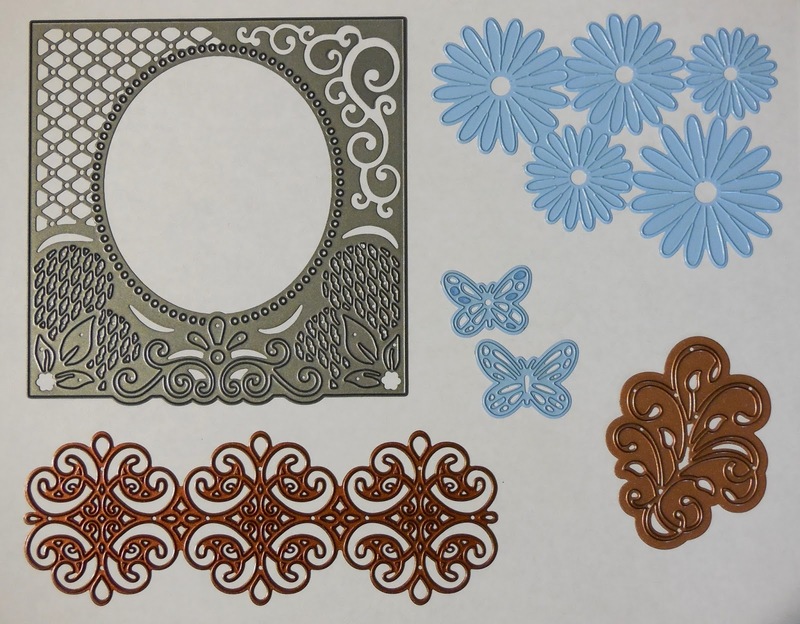 Lastly, I cut, shaped and glued the layers of the flower together and placed it as the focal point. This die always makes beautiful flowers and they're so easy to put together too! It's a die from Marianne Designs called Anja's Flower. This card measures 6.5" x 5". Here's a quick tip on how to line up your cuts perfectly when using striplet dies. Place the die on the one side of the card and make small pencil markings to show you the outline of where the first cut is going to be. Then place the die on the other side and use the pencil markings to align the second cut. For the inside of this card, I stamped the sentiment using Memento Tuxedo Black ink, and used another one of the butterflies from Marianne Designs. Now, I did mentioned that I had made 3 Sympathy cards since the beginning of the year, right? Well, if you missed the first one and want to take a peek, you can click HERE to read the post about it. And now to share the first card I made for my stash. I stitched the borders on this card and then used the butterflies from Marianne Designs as the focal point. I cut them twice for a little more dimension. To finish it off I added a few lilac gems. This is a 5.5" x 5.5" card. Like with the other cards, I kept the inside very simple. 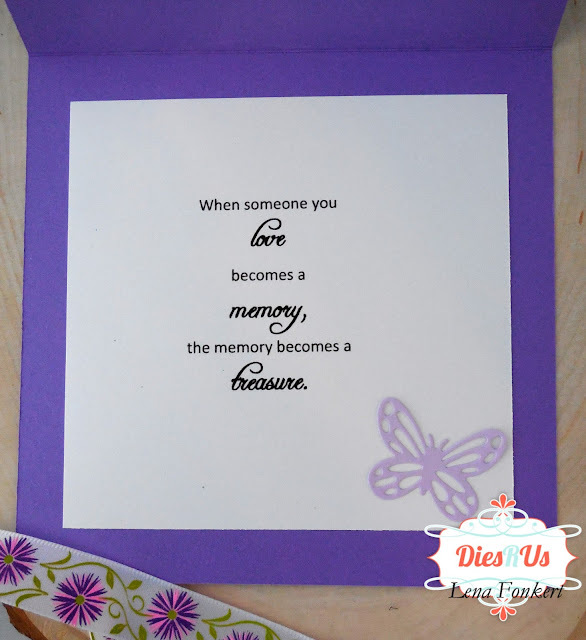 I printed this sentiment and then trimmed the cardstock to the correct size. I had a little butterfly left over, so I used it on the inside of the card to add a little more interest. Sorry for the need, but they are BEAUTIFUL! Such beautiful cards. Love them all but the first one is my favorite. So soft and pretty. Three beautiful cards Lena! They are so difficult to make when necessary so you're smart to make them just to have on hand. Thanks for the great tip on lining up your dies! The stitching on the last card is just stunning! What gorgeous cards Lena and what fabulous tips ... thanks so much! 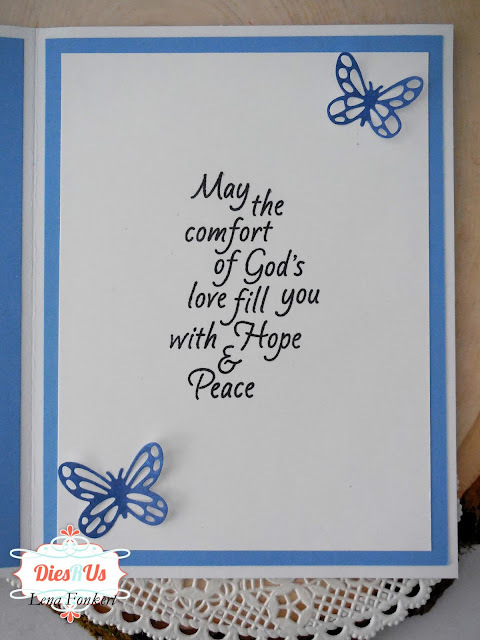 Yes, it's unfortunate, but it is easier to have a few sympathy cards on hand and for some reason (maybe because of my age) but I seem to need a lot of this style card lately)! Thanks for a wonderful post filled with inspiration! So glad that I saw this today. Your cards are amazing and thanks for all of the tips. So much inspiration packed in this post. Each card is a beauty. gorgeous cards! I am in need of sympathy cards, thanks for the inspiration!